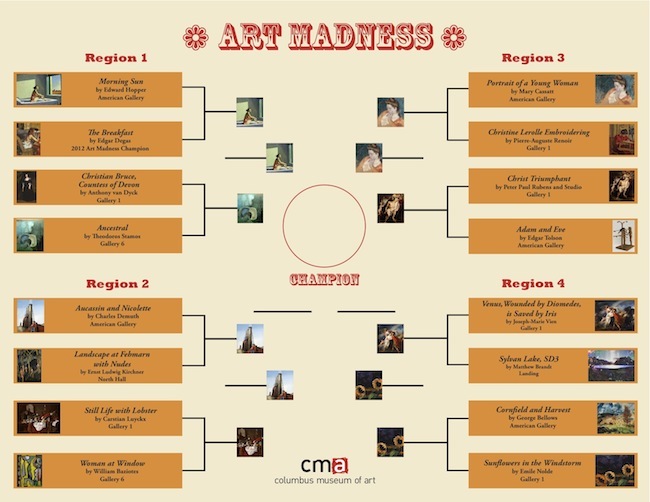 We’re down to the Final Four of Art Madness, our version of March Madness for Art Lovers. It’s been a strong run for the Americans in Art Madness 2013. Three of the Final Four teams are works by American artists, including Edward Hopper’s Morning Sun, which in the first round took out The Breakfast by Edgar Degas, last year’s Art Madness champion; American Impressionist Mary Cassatt’s Portrait of a Young Woman, which won handily over work by fellow Impressionist Pierre-Auguste Renoir and then art giant Peter Paul Rubens; and Charles Demuth’s Aucassin and Nicolette, which first beat work by German Expressionist Ernst Ludwig Kirchner, then work by Dutch Still Life artist Carstian Luyckx. German Expressionist Emile Nolde’s Sunflowers in Windstorm is the sole nonAmerican in the Final Four. Who will be crowned the Art Madness Champion? It’s all up to you! Vote on our Facebook page by liking your favorite from the Art Madness Match of the Day, or in person in our lobby (in person votes are worth double!). The artwork with the most votes/likes by the next day will advance to the Championship Match, which will take place starting Saturday April 6, 2013 -Monday April 9, 2013. We’ll announce the winner on Tuesday April 10, 2013. Final Four Match 1: Portrait of a Young Woman by Mary Cassatt vs. Sunflowers in the Windstorm by Emile Nolde.